I did not watch that game in Kano between Kano Pillars and FC Ifeanyi Ubah, just like millions of Nigerians who were not at the stadium didn’t. A lot of people have written commentaries on a game they did not watch. They have thrown jibes at FC Ifeanyi Ubah as a club and Dr. Patrick Ifeanyi Ubah as a person and some went to the extent of calling for the removal of Mallam Shehu Dikko as chairman of the League Management Company, the body that administers the Nigerian League. 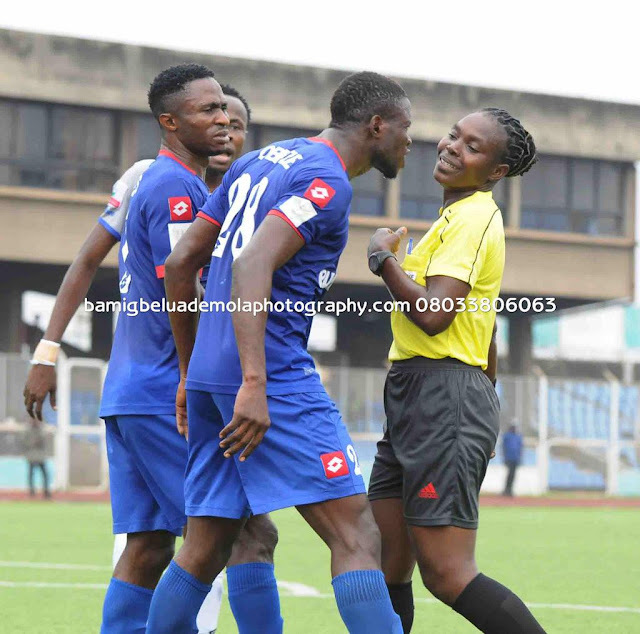 Another group of Nigerian poured invective on the center referee, Folusho Ajayi some as much as using unprintable words on her. Most of these did not see the game or the action that led to the discussions. Some turned it into a gender thing and started a rallying cry against women officiating the men game, something that should not have been. These, however are my thoughts on the whole scenario. I think this one has been over flogged already. In the heat of the moment, they took a decision to stop play and the game was abandoned. It was the first game of the season, the star game of the season. For a league that is begging for attention and affection, we did not need that to happen but it did. Fans were watching, pessimists were too and most of all, the would be advertisers were watching with an eye on the English League until that moment of madness. To show a contrite heart, the club have apologised for their action and have gone ahead to suspend the Team Manager, the one they say took the decision to walk out even though some say he took a bullet in the chest for some bigger person. The League Management Company have on their part sanctioned FC Ifeanyi Ubah for their actions but the Nnewi based club must do more. This must not happen again, especially from them. They must work in tandem with the Nigeria Referees Association to educate their players on the laws of the game and how to act towards referees decisions as not all of them will favour your team. Nigerians do not want to see or hear about scenes like what happened in Kano again. Yes, they apologised and yes they suspended an official who they felt was wrong, but the club must from now on be a shining light for others. Never should they be associated with incidents like that anymore because the country and the world are watching. I saw a section of people on social media throw negative and highly insulting banter at the president of the club, Dr. Ifeanyi Ubah because of the incident on Saturday. Not to speak too much on that issue, I do not think he deserved what was thrown at him. I do not know if he was at the stadium or if he was seen ordering his players out of the pitch because all fingers pointed at the Team Manager. Another school of thought that said the Team Manager spoke with the president before the instruction was given is all conjecture. The Team Manager had a right to educate who he was speaking with on the positives of not abandoning a game. The players too could have called the bluff of whoever told them to walk out by continuing the game. It could have saved the club all the trouble. Having said all this, unless there was ocular proof of the club president giving the instructions for the players to stop play, I think he should be left out of it. Some people tried to trend a hash tag on twitter that day, #ShehuDikkoMustGo. I believe they even succeeded in trending it. The grapevine says it was sponsored by FC Ifeanyi Ubah but again that could just be social media. However, a certain Twitter, @LordVerbinski was very active in the #ShehuDikkoMustGo trend and I remember he was one of those who went to London on the bill of the club last December, but how does Shehu Dikko factor in all of these? Nigerians are the best at idol worship. In fact we hero worship so much that even the Israelite in the wilderness would need to learn from us. At every turn we praise individuals and not a system so if that system fails, it is just natural that the blame would fall on individuals and not the system, and I will explain. Mallam Shehu Dikko has done so much to improve the league, continuing from where Chief Nduka Irabor stopped. Irabor did not work alone and neither is Dikko working alone. They are part of a system which they lead. An issue came up in 2016 when the league was under threat of a court injunction and rather than the Nigerian press to educate the public on why the league should stand strong, they came up with a trend, #IstandWithShehuDikko which if you ask me was completely wrong. Why were they standing with Dikko then and not the League? Hero worship. Dikko was/ is just one man charged with running a league which is a system. If the system refuses to work, it does not matter how intelligent he is, the league will fail. There is no doubt, Shehu Dikko is a very intelligent who has brought in a couple of innovations but it can never be about him. It was no wonder, however, that myopic people started a trend on Saturday calling for Dikko’s head, because if you praise the man in good, you should blame him in bad. And just to give out a little information here, Shehu Dikko or the League Management Company have little or nothing to do with the match officials. The referees are produced and trained by the Nigeria Referees Association, NRA; they are appointed by the Nigeria Football Federation, NFF Referees Appointment Committee. The LMC only briefs these two bodies on their calendar so they know when referee are needed for games. The LMC does not even have the power to appoint referees for their own games. So there is no reason why Shehu Dikko should go over the incidents of Saturday, January 14, 2017, unless there is something they have not told us. I took time to watch that clip over and over again and I did not see anything wrong in what Folusho Ajayi did. At least from my layman’s point of view she set up the wall for a free kick and before the kick was taken she blew her whistle ending the first half of the game. The kicker went on to take the shot and it went in causing all the controversy. Maybe if the kick hadn’t gone in there wouldn’t have been this much furore. Now, unless there was something else she had done in the first half or when the second half resumed, but based on that free kick at the end of the first half, I am still yet to see the wrong in referee Folusho Ajayi. Based on this, Funsho Ajayi was completely right in what she did. Sentimentally, Nigerians would ask why she allowed the wall to be formed if she wouldn’t have let them take the free kick, but it is the law, not the book of Songs of Solomon or Lamentations. However, Funsho Alabi’s track record does not exactly paint her in glory. In 2016, she was at the center when the Federation quarter final game between Enyimba and Rivers United was abandoned after a penalty kick was awarded to Enyimba. Still in 2016 on the last day of the season, she was at the center in Jos in a League game between Plateau United and Heartland where Heartland refused to continue play after a goal they scored was disallowed. These are not good ways to remember referees and I trust Nigerians to always remember these three games when her name is mentioned. Should women be stopped from officiating the men game? A few people threw up this sentiment saying the magnitude of the game was to big for a woman to handle and questioned the decision of the NFFs referees appointment committee to have women at such big games. I sincerely do not think it is a gender thing even though the issue of women officiating in the men league should be discussed later. Through out 2016 there were cases of games abandoned (at least 10 of them) due to perceived poor officiating and more often than not, we had men at the center. The issue of poor refereeing decisions is not a gender thing but something personal. Either the referee had an agenda or the referee was totally incompetent but nothing to do with gender. An unfit referee is unfit whether male or female; a bad referee is bad whether male or female; a referee on a mission is a referee on a mission whether male or female so I would not play that card just yet. It is not palatable that this incident happened on Match Day 1, but the league and the clubs now have enough time to make amends. There are 37 more match days and personally, as a fan of the league I will be hoping, fingers crossed that it does not happen again. This is what I think of the whole situation. Thanks for taking time to read.